The California Boulevard, Gurgaon: World on a Platter. 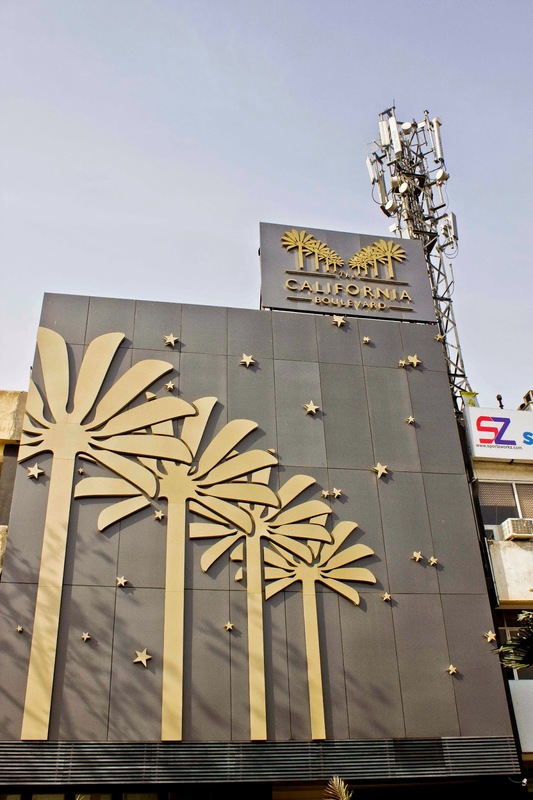 The California Boulevard has definitely cheered up the Gurgaon food lovers by opening its recent outlet in Sector 29, Gurgaon. 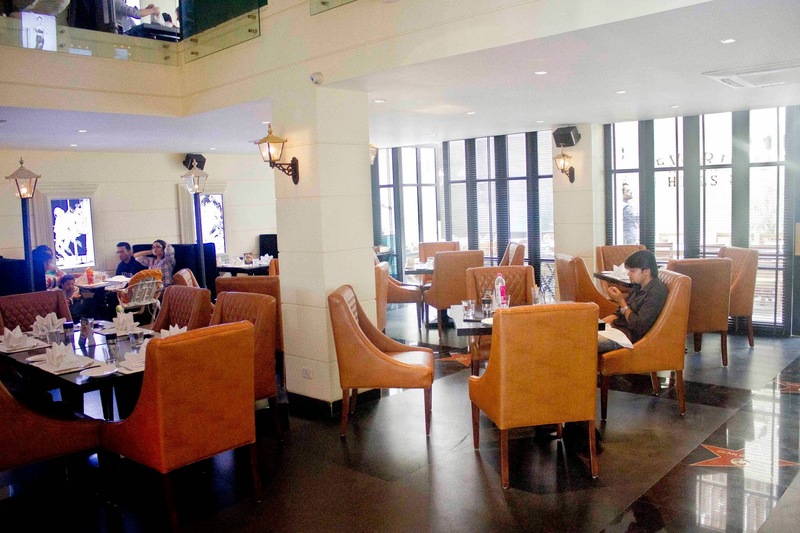 From a compact restaurant in Rajouri Garden, it has raised its capacity to a huge two floored restaurant with a big façade that is brightly lit up at night. The restaurant will welcome you with its iconic Harley placed just outside the restaurant, tempting you to have a picture clicked with it. 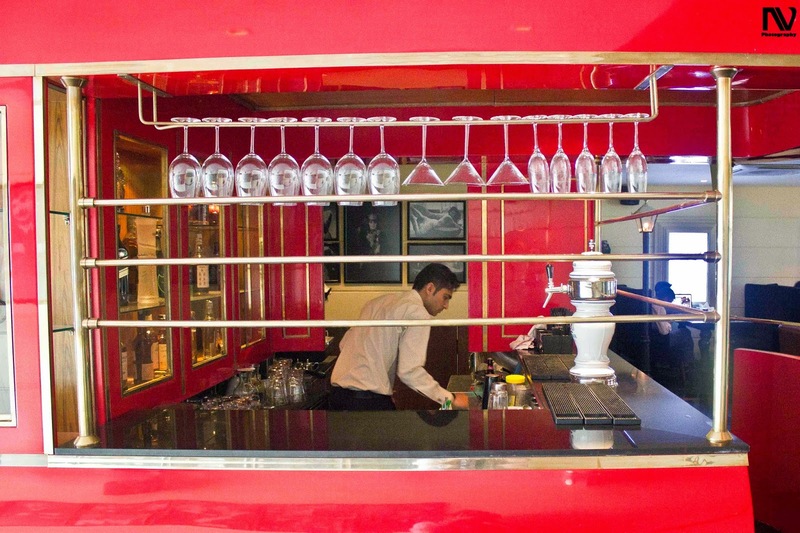 The bar in the restaurant too resembles a train coach in all its adulation with different types of cocktail glasses adorning the shelves. The restaurant also has an outdoor seating which I simply loved. Apart from the stylish interiors and lavish restaurant design, the chef has made innovative changes to the menu, adding The World On A Platter, which consists of small quantity of 8 different dishes from around the world, making you relish the gastronomic journeys from Turkey to Thailand, from China to Canada, from Italy to India, and from Japan to Jamaica. The platter is available both in Vegetarian and Non-Vegetarian versions. We started off with Beer Batter Fish. It is river sole fish fried in a beer batter and is crispy on the outside and soft and melt in your mouth from the inside. 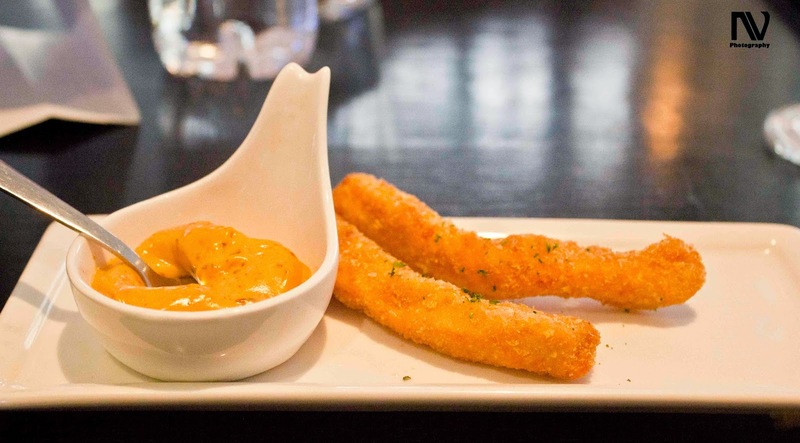 Accompanied with tartar sauce, this makes a perfect finger food to have with drinks and cocktails, which in our case were Long Island Iced Tea and Easy Rider (Beer, Bourbon and Cola). Next, we tried Prawns Spring Roll, from the Thai cuisine. The plating is similar to their Gandheri Kebab and does justice to the dish. 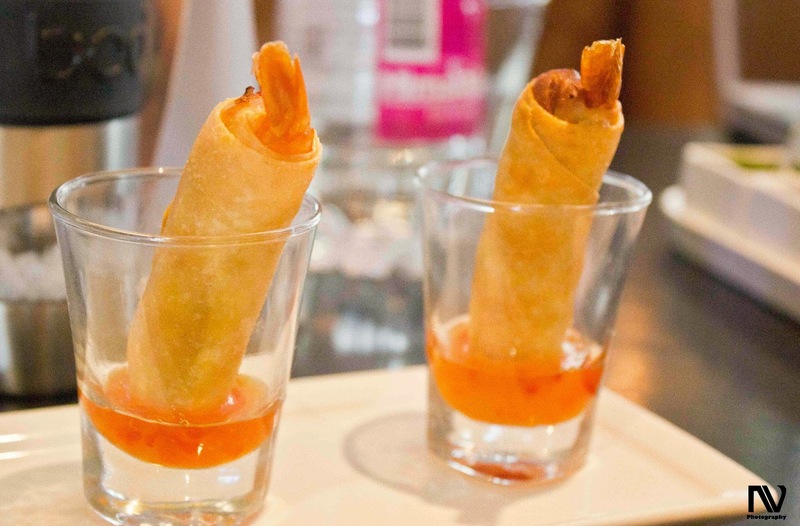 The rolls, which are perfectly fried are served inside a shot glass, resting along the sides of the glass wall with absolutely no traces of oil. The stuffing is of prawns, glass noodles, shiitake mushrooms, pepper and carrot and are served with a sweet and spicy sauce in the bottom which go hand in hand with the fried rolls. The Spring Rolls were followed by the Peri Peri Crispy Chicken, from Portuguese Cuisine. While the looks of the dish is quite plain and doesn't stand out much, the juicy and perfectly cooked chicken is quite spicy with all the flavors creating a riot inside your mouth, adding to the already delightful gastronomic experience. Although it was accompanied with Chipotle Mayo dip, it is quite delicious even when eaten standalone. The Crab Sushi, Japanese vinegared rice rolls, served here is a Makizushi, which essentially translates to being a nori (seaweed) rolled sushi. 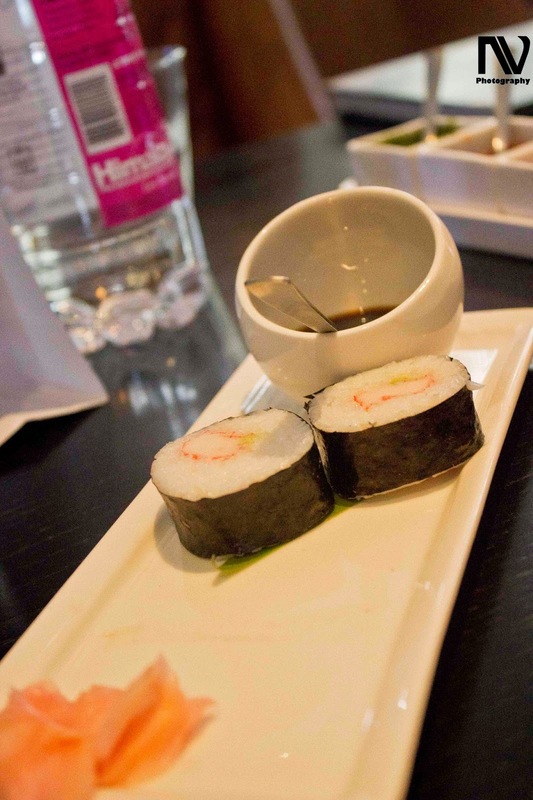 The crab meat is surrounded with white rice prepared in and wrapped in a sea weed, accompanied by wasabi kikkoman soy sauce and some pickled ginger scrapes. 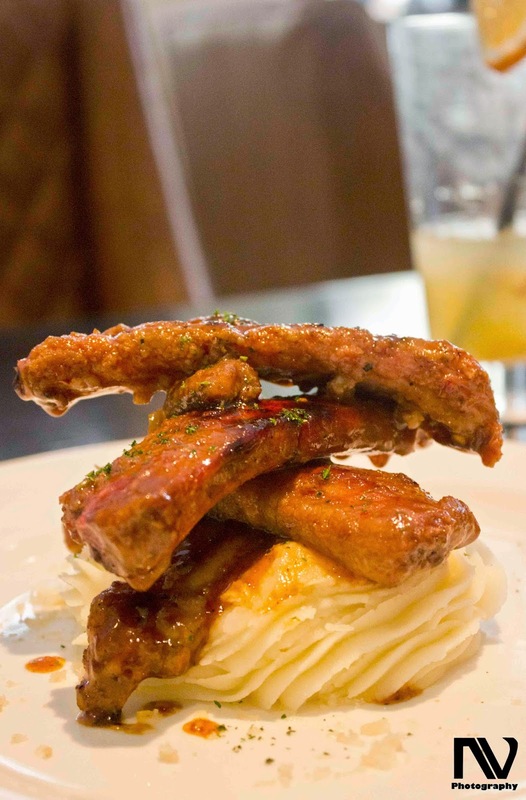 The Barbecue Pork Ribs served here is really juicy, coming of the bone. Served on a bed of mashed potatoes, it is served with some extra barbecue sauce. It is divine and is a must have here. For desserts, we ordered their famous TCB Gazzak Kulfi which as usual is out of this world. 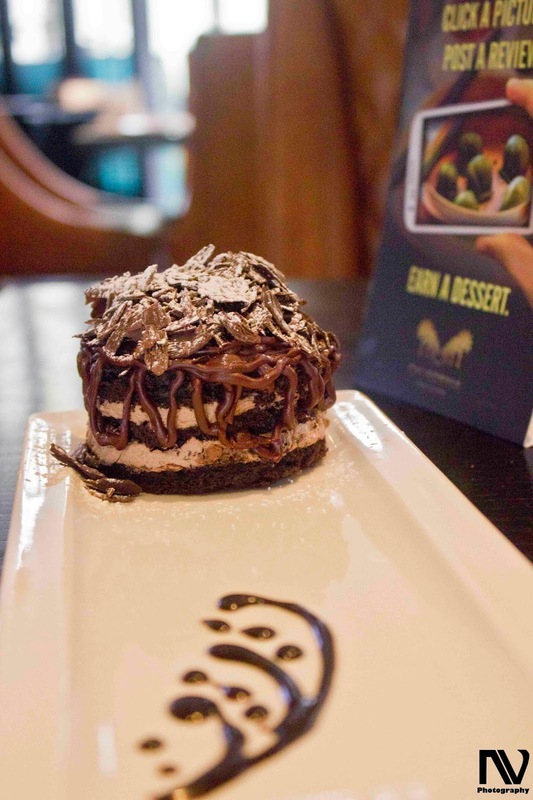 Wishing to try a bit more from their menu this time, we also ordered a Chocolate Nutella Torte which is heaven for all the sweet tooth out there. It is a multilayered cake with chocolate cookie crust and nutella ganache. Even though I was full I was not able to resist myself from having a spoon after another. 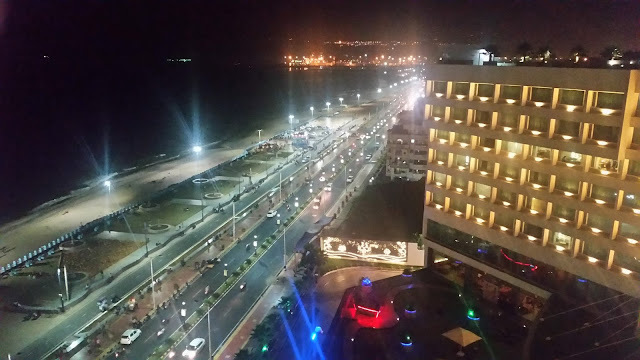 The California Boulevard, with nice ambience and great music, is a place to spend special occasions with family and friends with a huge lavish menu spread of the world cuisine. 5 min away from IFFCO metro station.